Right On is the debut album by singer Maxine Weldon, released in 1971 on Mainstream. 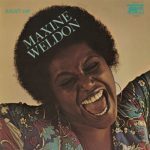 Maxine Weldon is an American soul and jazz singer. She is also an actress and live performer. Weldon recorded two full-lengths in 1970-71, with members of The Jazz Crusaders playing as session musicians on the album. She followed these with Some Singin in 1974, which became her best-selling record, reaching #48 on the Billboard R&B albums chart. Her last full-length was issued in 1975. In the 1980s and 1990s she performed frequently but did not record; in 1995-1997 she performed in the Broadway production of Black and Blue and later in the 1990s toured with Linda Hopkins. Record Company – Mainstream Records, Inc.
Record Company – Red Lion Productions Ltd., Inc.